Sustainability is key to business and career success in the 2020s. Whatever part of the organization you work in, whatever type of organization you work for, sustainability is impacting it right now. This program will give you the tools and knowledge to thrive and succeed in this rapidly evolving space. It will help you be more effective at delivering value and impact, regardless of your role or responsibility. You will learn to understand and use key business performance drivers (impact measurement, partnerships and collaboration, reporting and communication, stakeholder engagement and more). The program focuses on using sustainability to deliver impact, value, and results and will enhance your performance regardless of whether you work for industry, government, international organizations, civil society or faith-based organizations. 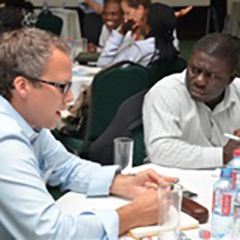 Be part of an accomplished and diverse participant group from throughout Africa and around the world. Spend a week learning with and from each other with a focus on role-playing scenarios, group work, case studies, and real-world simulations; a pragmatic and effective “learn-by-doing” environment that will produce results. This program is designed for executives, managers, and leaders with strategy, leadership, and P & L responsibility. It will also be relevant and interesting for sustainability leaders, marketing, communications, and corporate affairs personnel. It is appropriate for private-sector, government, NGO, non-profit and faith-based organizations.